See the new version, Twitter Image Host 2, which stores images as actual WordPress posts, for more easy customisation and management. It can be run at the same time as Twitter Image Host, for easy migration. Keep your traffic in the family! Host Twitter images on your own site, with support for comments and trackbacks, image resizing and thumbnailing with Lightbox. Twitter doesn’t yet come with its own inline image support, so we tend to be limited to using image hosting services, and linking to them with short URLs. So, services like Twitpic host the image, and we direct traffic to them in return. Better to take advantage of that traffic, and host images on your own site. This way, viewers come to your site, instead of someone else’s! Posted images are displayed in your normal WordPress template, with support for comments and trackbacks, without any setup required. Most themes should work with this, but if not, or if a different layout is required, a custom theme template can also be provided (see ‘Creating a Template’). Provides an HTML form for posting image content, as well as an API modelled on that of img.ly, compatible with Tweetie (for iPhone) and any other Twitter clients that speak this protocol and offer configuration of custom image hosting services. Uses Twitter’s authentication and a list of authorised accounts, so you can let others use your image host too. You can even post status updates to Twitter while submitting images. If you like Twitter Image Host, please consider buying some awesome Mac/iPhone software. Then tell all your friends. You probably need to create the folder in which Twitter Image Host stores uploaded images — it will try to create the folder automatically, but it will fail if it doesn’t have permission. Create a folder called twitter-image-host-content within the wp-content folder of your WordPress installation, and make sure it has write permission for the web server user. Make sure your blog is using URL rewriting (i.e. your permalink structure is anything but the boring default ?p=###). To use the widget, simply visit the Widgets page and drag the “Twitter Images” widget into a sidebar and configure it. Shortcodes are snippets of text that can be inserted into pages and posts. These snippets are replaced by various generated content. Twitter Image Host provides a ‘twitter-images’ shortcode to display images you have uploaded within a page/post. Tip: Use this in the twitter-image-host.php template (see ‘Creating a Single Template’, below) to display other posted images when viewing an image. Use the_twitter_image_author() to filter the list, to show only other submissions by the same Twitter account as the one of the currently displayed image. This plugin provides several template tags, for use both in displaying single posts (see ‘Creating a Single Template’), and for custom pages which display many posts in a loop (see ‘Using Template Tags in a Loop’). Returns HTML to display the image and a link to the full-sized image if it exists, with Lightbox rel tags. By default, this plugin will use the standard post template (‘single.php’). However, if you wish, you can create a custom template to display hosted images. The template should be called ‘twitter-image-host.php’, located within your current theme directory. On your server (via an FTP program, etc. ), navigate to your current theme. This will live within wp-content/themes. Copy an existing template – single.php is usually a good candidate – and call it twitter-image-host.php. Open up twitter-image-host.php, and delete everything that looks post-related: This usually includes everything between the have_posts call and the matching endif, and may include some other surrounding content like an ‘Edit this post’ link. Save the file, add some content (see the ‘Posting Images’ section), and see how it looks. Just like the WordPress Loop template tags, the template tags provided by this plugin can be used to display multiple posted entries. This can be used to create a custom page template that lists all submitted entries, with more flexibility than that offered by the shortcode. Use begins with a call to query_twitter_images(), possibly with an argument to configure the search. If the result is true, then the loop begins, conditional upon has_twitter_images(), and starting with next_twitter_image() to load the next entry. The single template tags can then be used to customise the display of each entry. 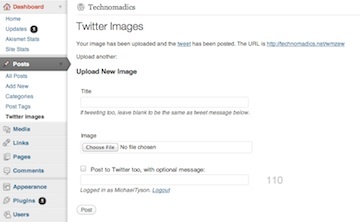 To start posting from your WordPress blog, select the “Twitter Image Host” menu item from the “Posts” administration section. Enter a title for your image, select your image file, hit Submit, and you will be given the URL for the image. If you wish to tweet straight from this facility, you will need to follow the instructions from that page to set up the plugin. To access this facility from an application, use the access point displayed on the Twitter Image Host options page under “Settings”. The API is more-or-less the same as that of TweetPic, img.ly, etc. To post from Twitter (Tweetie 2) for iPhone, visit Twitter/Tweetie’s settings, and within Services, Image Service, select ‘Custom’, then enter the API URL as listed on the options page. If you run WordPress from a sub-directory (for example, http://your-site.com/blog), then the short URLs generated by this plugin will look like http://your-site/blog/xxxxx. You can remove that ‘blog’ component via a little .htaccess trickery. Create and open a new file in your site’s webroot called “.htaccess”. If there’s one already there, just open that up and prepare to edit at the bottom. Have a corresponding file within Twitter Image Host’s content directory Then, it’ll rewrite the request silently to the real Twitter Image Host URL, without the viewer seeing. Yes, I’m afraid I introduced a bug in 0.2 that slipped through the net. I’ve just released 0.3 – it should be online within the next hour. I followed your instructions but I can’t get it to post via Tweetie on the iPhone. I’ve set my Tweetie settings to use custom service at http://mashablepete.com/twitter-image-host. I’ve also created a folder in http://mashablepete.com/wp-content/twitter-image-host-content with 777 permissions. I’ve had similar problems with other self hosted twitpic plugins. Hi Pete; The new version should work now, and there’re now instructions above on how to make it work. You specify http://your-blog/twitter-image-host/upload as the access point, and all should be well. Michael! It’s working! Woohoo! However my page is getting all kinds of garbled text with this plugin activated. Check it out here > http://mashablepete.com/2mty3 Any idea’s ? Yeah, that one’s quite mysterious, but I’ve released a fix that should make WP shut up – Update and all should be well. Awesome I’ve got it working now. I upgraded WordPress and the plugin. I’d like to be able to have a “twitpic” page on my site where all of these photos get loaded too. Ideally the most recently uploaded photo would be at the top and thumbnails of all previous photos would be listed underneath it. Can you tell me how to do this or is this what you referring to in the “create a template” section below? This is now supported in Version 0.5 – see documentation above for info. Any chances that this will eventually support older phones, sending images as attachments using SMS? I currently use MobyPic as it’s the only one that does this, but would love to keep the images on my own domain. Do you know why this could be occuring? I just installed the plugin and love the idea. I am getting the same error as Teckam, though. Thanks for your work on this..
You new uprgade works like a charm, thanks! Anyone else having this problem, should no longer have this problem after upgrading the plugin. I changed nothing and the errors were gone! I can also confirm that the update fixes the problem. Thanks. love using this plugin. Hope that eventually other mobile twitter apps will have custom image settings. Are there any plans to add to this plugin ie. a profile page with the gallery? This plugin has lots of potential, thanks again. Everything works great! Thanks for this great plugin! I owe you a beer! Version 0.51 broke my installation. Now when I upload a picture from Tweetie 2, or try to click on one of the pictures in my blog sidebar it returns an error. Hi Chris – it looks like there’s no ‘single’ template in your WordPress theme, which is why it’s having problems; I’ve released a fix that will fall back to the index.php template from the theme. Let me know if there are further problems. I am thoroughly impressed. It works like a charm. Just a note, I installed the WP-Touch plugin to make the blog more iPhone friendly and when coupled with this plugin the load times for pics are reduced and it looks great. I owe you a coffee (or drink of your choice). Glad to hear it! That’s great. i installed everything correctly but everytime i attempt to upload from tweetie 2 i get an error message saying there was an error posting my message. any suggestions?? thanks again. That should return something that contains a <mediaurl>http://your-site.com/abcde</mediaurl> string. If all of that still works, then the problem may lie with your iPhone’s internet connection, perhaps. anything else i can try? i really appreciate your help. btw, i own talkie, and talkie for mac and i love both! I see this works on a friend’s blog. Not sure what the issue is with mine. Hi! I seem to have got it working, but… 1. installed and activated plugin 2. made a twitter-image-host.php based on single.php in theme folder 3. uploading with posting to twitter works 4. page opens and shows pic but: my logfiles tell me code 404 for every page call? If the filename is empty, then the image upload has failed, and it should be reporting an error. I’ve emailed an updated version to you that should report the error better (replace the existing file in wp-content/plugins/twitter-image-host with this), but something else is causing the upload to fail, and the failure happens outside the plugin. How are you uploading the image? Via the web interface? Is anything reported in your webserver’s error log (if you have access to it)? Any thoughts on my error? Ah, I’m sorry Chris, I missed you! What WordPress version are you using? It sounds to me like it may be a tad outdated. Oh dear, it’s not that, then! I suggest you get in touch with the author of the troublesome plugin in question (WP Contact Form). Unless there’s something more weird going on, it’s not Twitter Image Host that’s causing the error. I deactivated the Wp-Contact form plugin and got the correct page. [Thu Feb 18 08:02:16 2010] [warn] RewriteCond: NoCase option for non-regex pattern ‘-f’ is not supported and will be ignored. I suspect the permissions need to be changed in some folder to allow the world to write to it. Is this correct? Also, how to prevent the world from using me as their twitpic? I want this for me only. I know its me, but please help anyways!? Hi Martyn, Unless you’re using IIS too, make sure you have a custom permalink structure set up, not just the default ?p=###. This will enable URL rewriting, required for the plugin. I installed this but cant work out why its not working? i cant visit the address as mentioned above (i assume mine should be http://lewisjuggins.co.uk/wordpress/twitter-image-host but nothing happens. If you do figure it out, I’d love to know how, though. Sorry I can’t be more help. I’d say it’s probably a rewrite issue, yes – I’d try turning it on, and see if it works. I’m not quite sure if this plugin’s at all IIS compatible, but it’s worth a try. Good luck! Thank you very much. Playing with it and it works great. Hmm, another one. The posts and comments are not showing up in the backend. The posts won’t show up in the back-end, because they’re actually not posts: Just ‘simulated’ posts so that they can be commented on. The only data associated with each uploaded image is the image itself, and a file called .meta in the same folder as the image file. The comments thing is a known issue, one I’m hoping to figure out a solution to – it also stops comment notifications from working. Hopefully I’ll work it out some time. Oaky. I’ll disable comments for now. I am using it as a twitpic replacement, so do not really need it. Bump for editing/management of uploads/comments. Right now, Askimet is saying that I have 11 spam comments in the queue, but they’re not showing up. I assume this is because they’re comments on my Twitter image uploads. Also, I have some images that I’d like to delete….. and I have no idea how. Apart from that, love it! Just spent some time on it – it’s a bit of a large job, because I’m only emulating posts (to keep things clean) and want to maintain compatibility across as many WP versions as I can. I’ve made some ground, though. @Michael: Thanks – your quickfix works fine. Thanks a lot! Hello – What WordPress version are you using? Oh, wait a moment – that’s the wp-contact-form plugin – this is twitter-image-host, which is a different plugin. Best talk to the developer of that plugin instead. I just wanted to say thanks for this plugin. It’s just what I was looking for. I hope that you keep developing further and adding more features (it’d be great to support video :). Also, I’m having a little problem and I’d like to ask you about it… I’m not able to change the images resolution. By default it’s 500px, but if I increase it and save it, it goes back to 500px. Is it there a way to fix that? Another thing is an aesthetic issue. When I create a page where I want to show the images uploaded using twitter image host, the way it displays the gallery is kind of funny. It shows these underlines (they are hidden until you hover the cursor), and there’s a big white space around the thumbnails. Again, thanks for your efforts! Hi JB – You’re very welcome! You’ll want to change the image dimensions in the Twitter Image Host options, rather than manually changing the image itself. It sounds like you may want to adjust your theme’s CSS – not having seen it, I can’t advise, but it’ll be something in your theme, I’d say. Thanks for your response. I think I haven’t been very clear explaining the issue I was having with the images resolution. What I meant is that what I’m trying to change are the size settings in the Twitter Image Host options. By default it says 500px, but it doesn’t matter the value I specify, when I save the Twitter Image Host options it goes back to 500px once the page is reloaded after saving. And then, whatever the actual resolution of my image is, it’s always scaled down to 500px. About the other issue, I’ll check my CSS and see what’s going on. I second the video support. Thanks!